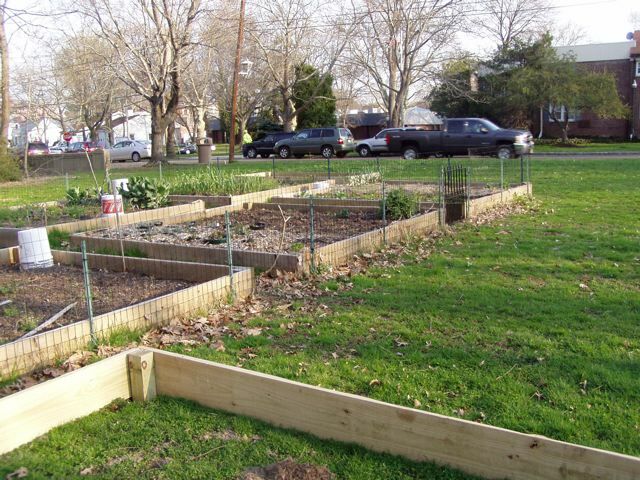 With a grant from the Community Catalyst Fund, the Springfield (NJ) Environmental Commission is finishing up Phase II of our Community Gardens. This winter provided a plethora/multitude of tasks for the Springfield Department of Public Works (DPW). The DPW are the fellows who build all of the wooden containers for the plots and then fill them with good dirt. Between the fall Leaf Collections and then the winter salting, plowing, and cutting tree limbs for all of the snow storms, the DPW has been almost overwhelmed at times. Finally, they have seriously begun to construct the rest of our gardens. New plots take root in the Springfield Community Garden. Originally the Grant money was to pay for six new 8′ x 8′ plots, fencing and a good composter. However, after planting for one season and having many more requests for plots; we have changed it to twelve new plots, fencing and a good new composter. We are grateful to the Community Catalyst Fund for believing in the work of the Springfield Environmental Commission and we look forward to a great growing season! This entry was posted on May 6, 2011 at 12:49 pm and is filed under Community Action, composting, environment, Food, garden-based education, gardening, Gardening/horticulture, organic, organic food, Uncategorized. You can subscribe via RSS 2.0 feed to this post's comments.